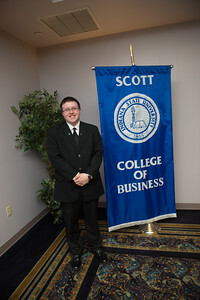 It was won by the Scott College of Business for its BS in Accounting. 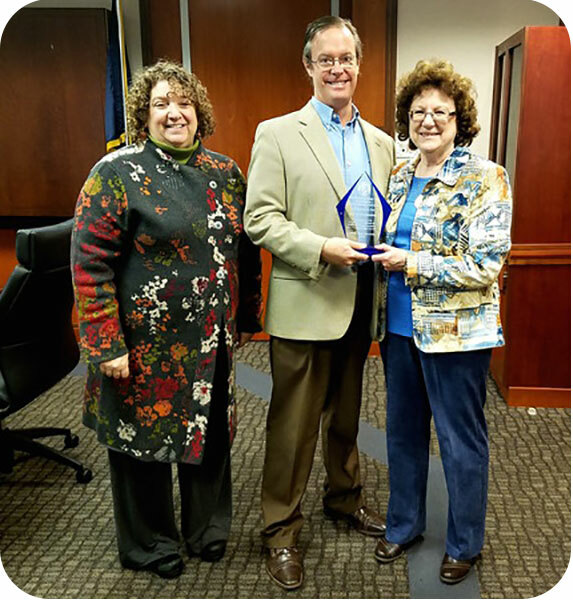 Susan Moncada accepted the award and congratulations to all the Accounting faculty for their hard work toward this effort, and particularly to Susan who is a leader and mentor in so many ways. 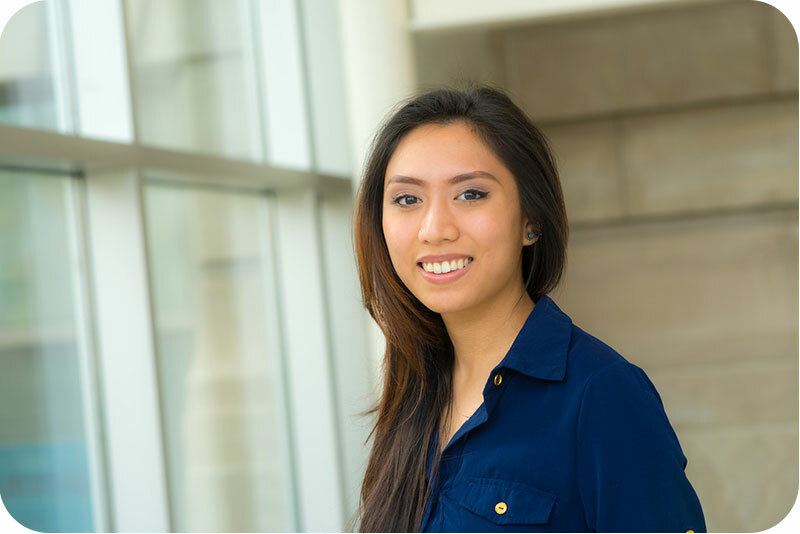 Maybe marketing major Mikaella dela Pena wasn't exactly who the selection committee envisioned when they sent email to the graduating class seeking applicants for the student speaker at Indiana State University's winter commencement. After overcoming several obstacles Mikaella graduated and is now Indiana State's 2016 winter commencement speaker. 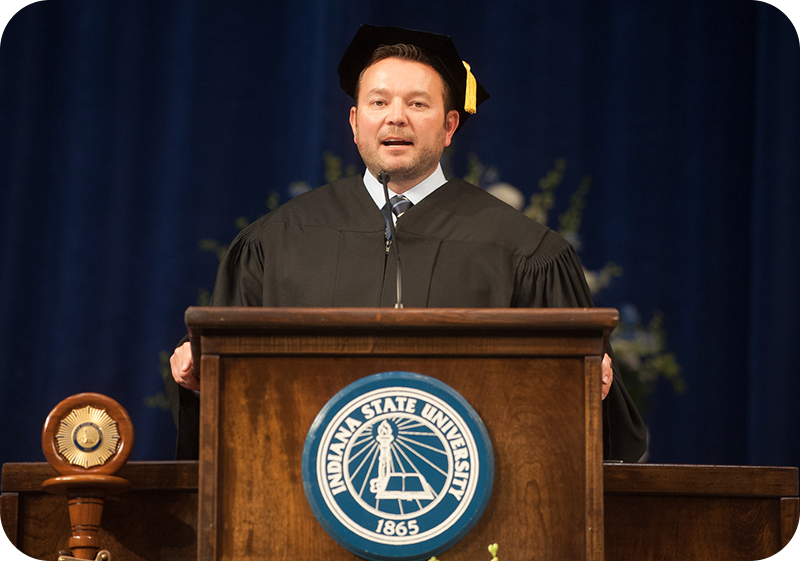 There is something fitting about the final hats off to Indiana State University’s Class of 2016 being delivered by alumnus Scott Molander at the Dec. 17 commencement ceremony. Co-founder of Hat World and now executive vice president for BSN Sports, Molander, MBA ’16, knows a thing or two about headwear and the heavy lifting required — not only to get an idea off of the ground, but also to nurture it into a successful, multi-million dollar endeavor. 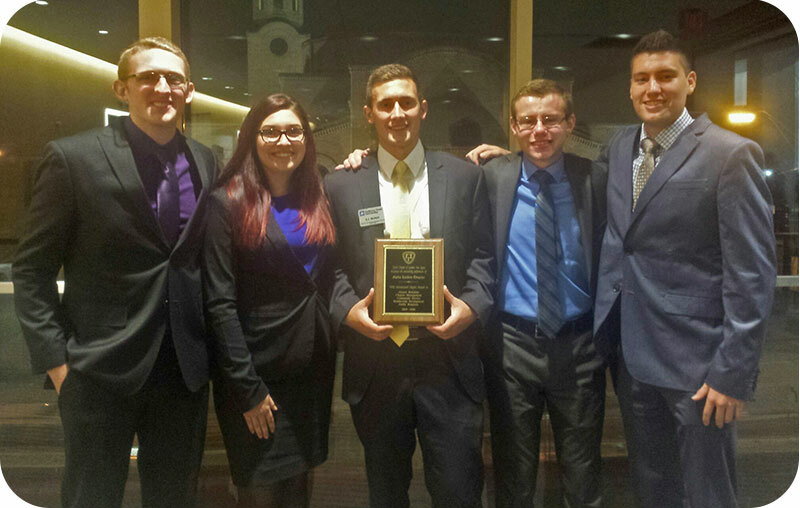 Alpha Epsilon, the Indiana State chapter of Gamma Iota Sigma, the International Risk Management, Insurance and Actuarial Science Collegiate Fraternity, , has just been awarded the Well-Rounded Chapter and International Chapter Award by the Board of Trustees and Executive Committee of the GIS. The award was given during the 45th Gamma Iota Sigma Annual International Conference in Columbus Ohio. 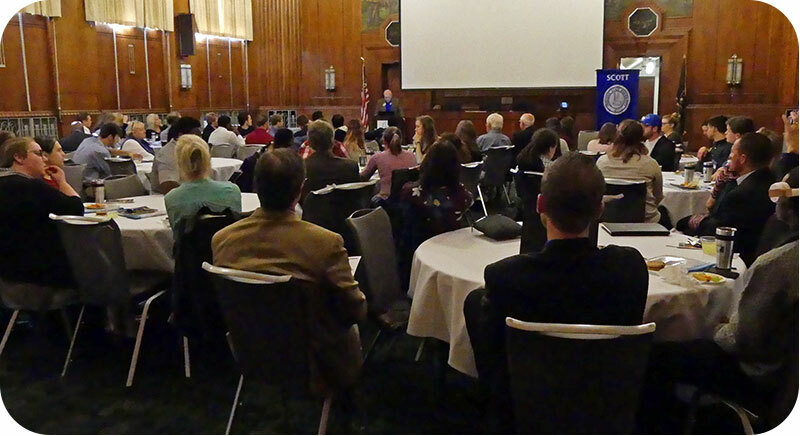 The Conference drew over 500 top risk management, insurance, and actuarial science students and advisors from 57 colleges and universities throughout North America, plus 71 sponsors, 62 career fair exhibitors, and over 250 industry representatives. 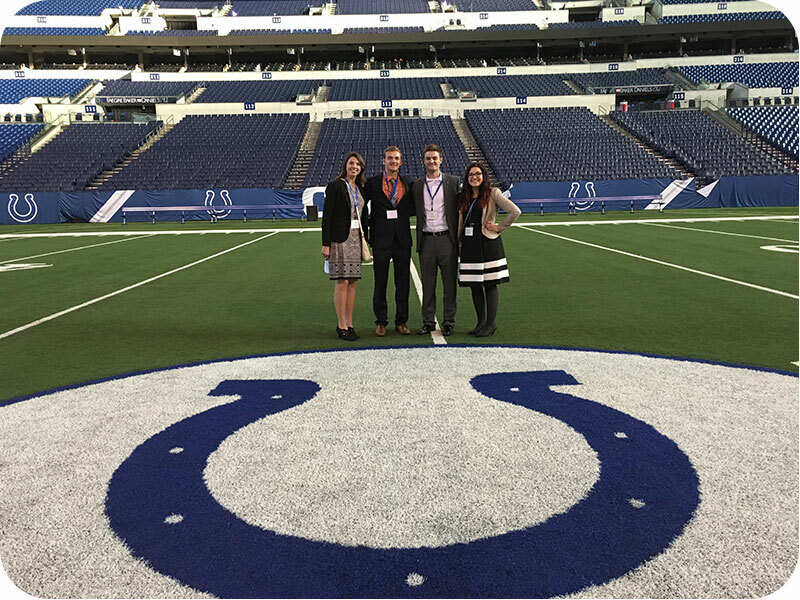 More than 400 interviews for internships and entry-level positions were conducted on-site during the 2016 conference, with multiple offers reported from participating companies and organizations. 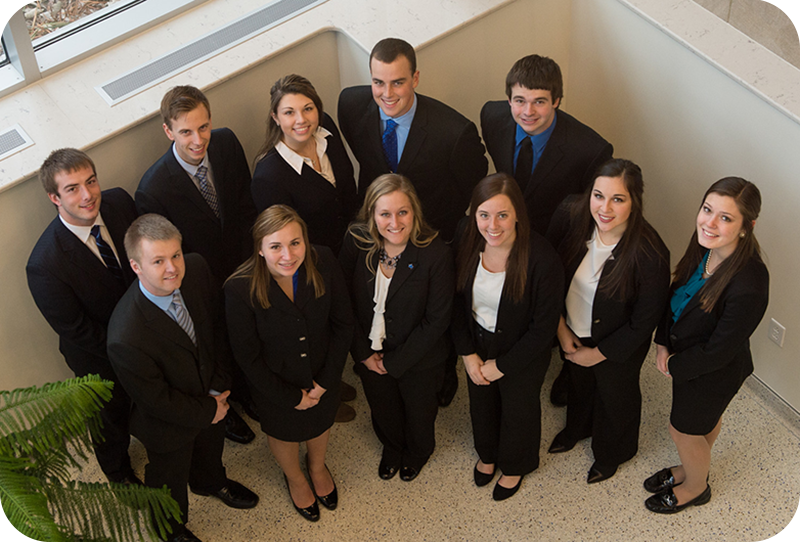 The purpose of this Gamma Iota Sigma is to promote, encourage, and sustain student interest in insurance, risk management, financial services and actuarial science as professions; to encourage the high moral and scholastic attainments of its members; and to facilitate interaction of educational institutions and industry through networking and by fostering research activities, scholarship, and improved public relations. Congratulations to Alpha Epsilon and their advisor, Rebecca Wray. Indiana State University has earned a spot on two rankings of the nation's top Master of Business Administration programs. The academic test preparation and admissions counseling company included Indiana State's MBA program in "The Best 294 Business Schools," the 2017 edition of its annual guidebook after analyzing institutional data and reviewing student surveys from the past three academic years. The Princeton Review highlighted multiple positive aspects of the program, including smaller class size and the university's proximity to Indianapolis, St. Louis and Chicago, and Terre Haute's low cost of living that makes it a desirable place to live, work and play. 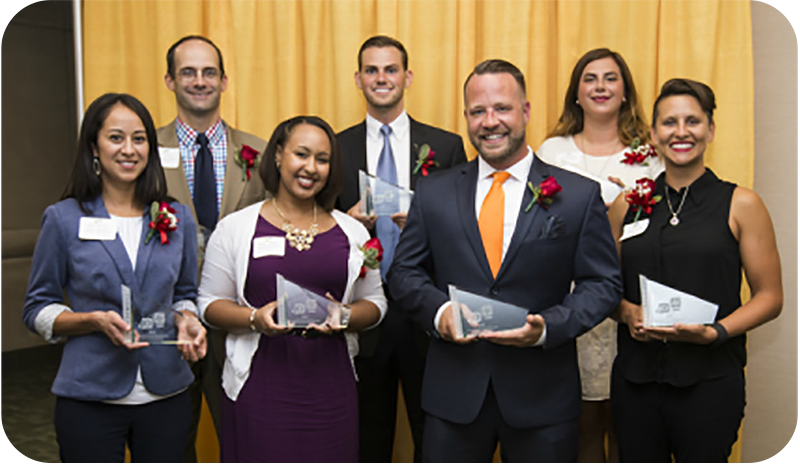 Presented by the Terre Haute Chamber of Commerce and Tribune-Star, "12 Under 40" recognizes young professionals who are making great contributions to the community. 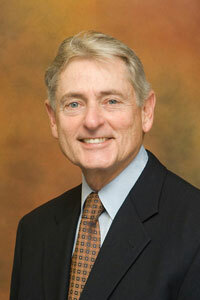 This year, several of the honorees are well-known to the Scott College of Business. Jeffery Clutter, GR’14, works for the Vigo County School Corporation as the assistant career and technical education director, where he oversees the Adult Education Program. 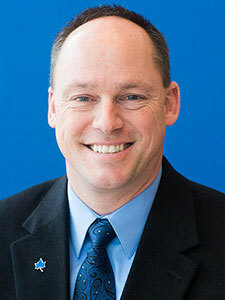 He is also enrolled in the new Woodrow Wilson MBA in Education Leadership at Indiana State and serves as president of the Indiana Association for Adult and Continuing Education. Brandon Henman, Finance '11, GR '15, is a vice president at Terre Haute Savings Bank, where he works as a mortgage loan officer. He serves on the boards of the nonprofits organizations Terre Haute Area Meals on Wheels and TREES Inc.
Courtney Richey, GR '10 works as regional director of the Small Business Development Center at Indiana State -- the "perfect career move for me as it is a perfect combination to satisfy my love for business with my philanthropic spirit," she said. Richey also serves on the board of directors of Junior Achievement, United Childcare, FSA Counseling Center and Young Leaders. 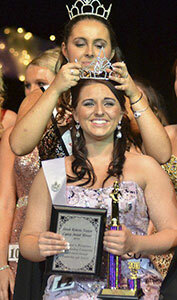 In 2015, Richey was named Young Leader of the Year. Business incubators around the world — and at Indiana State — help start-ups get a stronger footing during the precarious beginning stages. 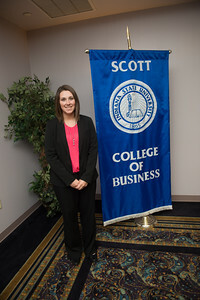 The corporate world isn’t for everyone, and Indiana State students interested in being part of the next generation of creators, inventors and moguls can learn what it will take to spread their wings through the Scott College of Business. 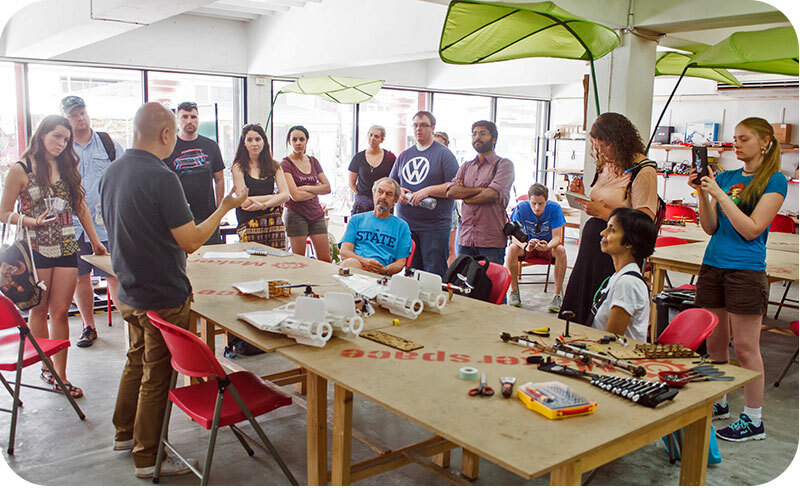 Nati Sang, left, CEO and founder of Makerspace Thailand, talks with Indiana State professors Aruna Chandra and Bill Wilhelm and students who were studying abroad to learn more about the country’s entrepreneurship and sustainability practices. A new working paper, Friends in the Right Places: The Effect of Political Connections on Corporate Merger Activity, co-authored by NFI's Director of Research, Reza Houston, Stephen P. Ferris and David Javakhadze is now available for download from their webpages. The paper was originally delivered to the 2016 Insurance Reform Summit in Washington D.C. and published by Elsevier B.V.
All of NFI's Working Papers can be found on their pages and on the RePEc website. 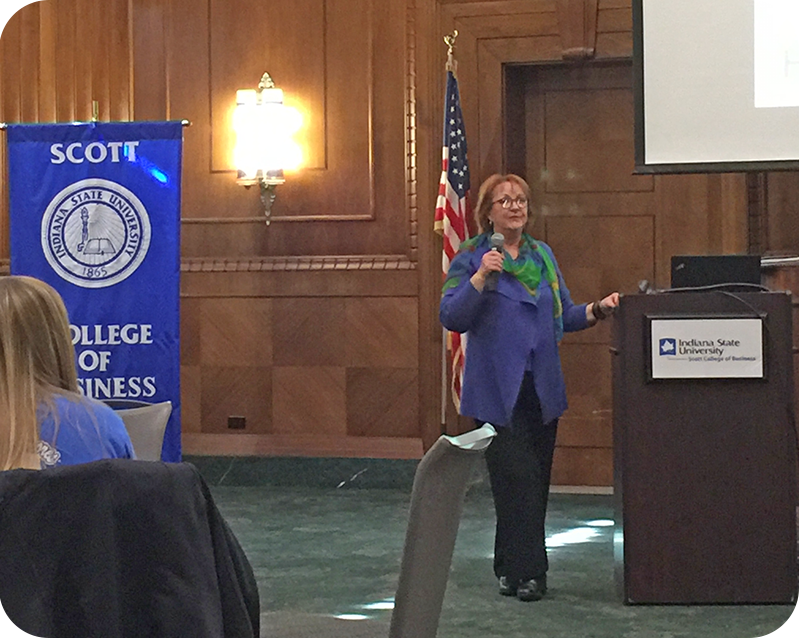 Panel: Indiana well poised as "Crossroads of America"
A panel of four logistics specialists addressed about 40 students at Indiana State University’s Scott College of Business about how to prepare for success in the industry. Indiana is the “Crossroads of America” and its central location is ideal for the logistics industry, which is expected to double in the state by 2035, according to Conexus Indiana, a private sector-led group focused on advanced manufacturing and logistics. 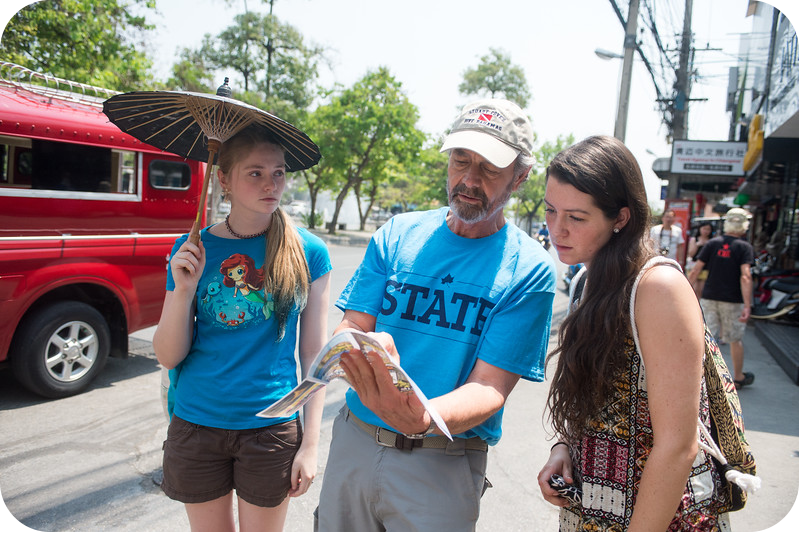 Indiana State prides itself on its global outlook; our student body alone represents more than 50 countries. Globalization has become the cornerstone of our way of life in the 21st century - corporations, academic and financial institutions, governments, people, and entire economies throughout the world are linked at a multitude of levels. Sustainability is essential in today’s environment as it affects both business practices and everyone’s quality of life. Ethics and corporate responsibility are also important and affect everybody. Bob Heaton, played alongside Larry Bird on the 1978-79 men's basketball team that competed for a NCAA championship. He was known as "Miracle Bob" for his late-in-the-game shots that kept the Sycamores' dream season alive. 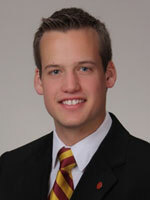 Heaton is a member of Pi Kappa Alpha fraternity and was a Blue Beret while he earned a business administration degree with a concentration in marketing. 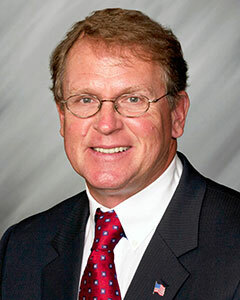 President of Heaton Financial Services since 2003, Heaton (R-Terre Haute) has represented District 46 in the Indiana House of Representatives since 2010. He was voted chief majority whip of the House Republican caucus and serves on the financial institutions committee as vice chair, insurance committee and natural resources committee. 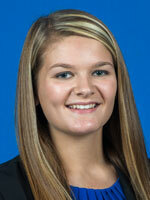 Heaton previously worked for Forrest Sherer Inc. as an insurance sales person. Heaton and his wife, Jane Ann, have two children and four grandchildren. Lifetime residents of the Wabash Valley, he serves the community through several community organization boards including the Terre Haute Convention and Visitors Bureau, Terre Haute Boys and Girls Club, Wabash Valley Youth for Christ and Leadership Terre Haute Class 5. The faculty of political science and public administration at Chiang Mai University extended an invitation to Bill Wilhelm, who is collaborating with professors at the institution for an ongoing research study measuring moral reasoning to learn how Thai students and young professionals handle ethical decisions. Corruption in the United States tends to be at the top, he said. 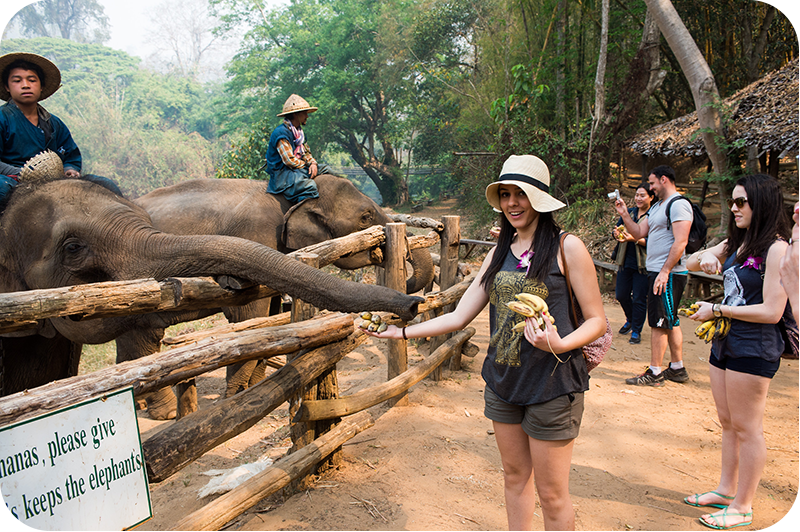 As with many southeast Asian nations, Thailand’s corruption occurs at all levels of society, and Chiang Mai University is turning to Wilhelm to provide education on ethical decision-making to help turn the tides. In February 2015, just before their demolition, the peregrine falcons that nested on top of Statesman Towers were moved to the Sycamore Building. The pair attempted to start a family last year prior to a nest box being built, but the eggs rolled off because of the slope of the ledge. This year they were more successful with three chicks being hatched. 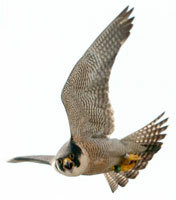 Indiana currently has about 20 falcon territories, 14 of which include nests with eggs. The population is a part of the best large-scale restoration effort for peregrine falcons, coordinated by the Midwest Peregrine Society. This image is of one of the falcons above Statesman Towers in 2012. 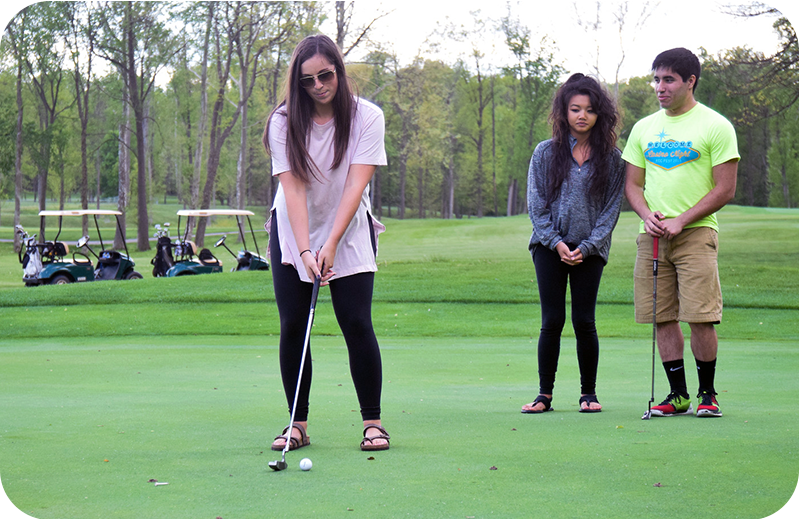 The President's Scholarship, awarded to 20 incoming students, provides full, in-state tuition and premium housing and has a total four-year value of more than $78,000. "Although only 20 of the approximately 180 applicants receive the scholarships, each student is already a winner by the mere fact they qualified receive this honor. 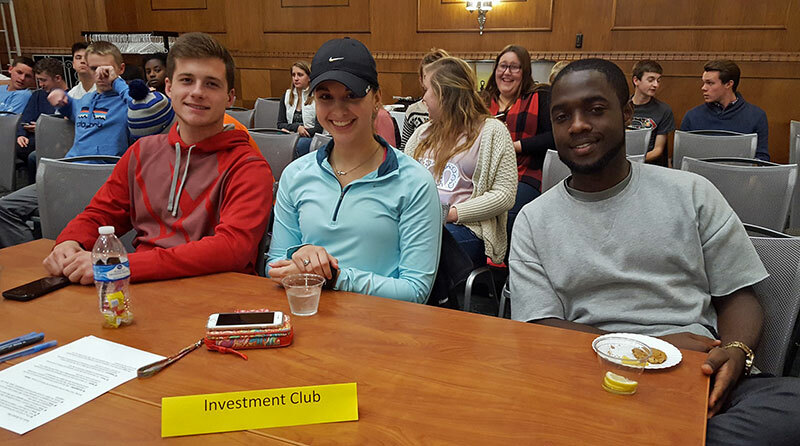 This event is truly wonderful to take part in, as these students are a delight to meet and engage in conversation," said John Beacon, senior vice president for enrollment management, marketing and communications. 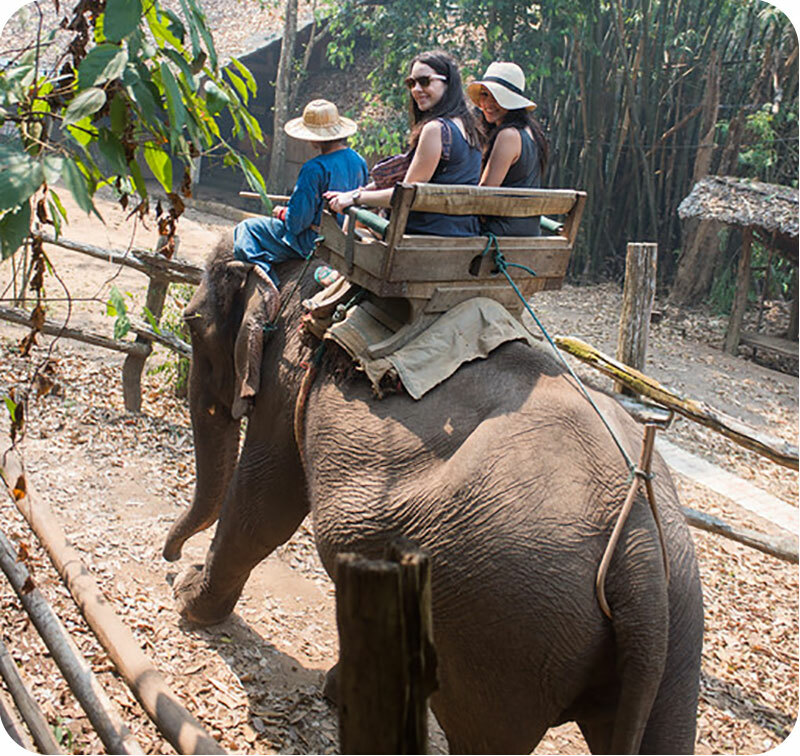 MBA students Meryem Sqalli Houssaini and Salma Chakour participated in a spring study abroad trip to Thailand led by professors Aruna Chandra and Bill Wilhelm. 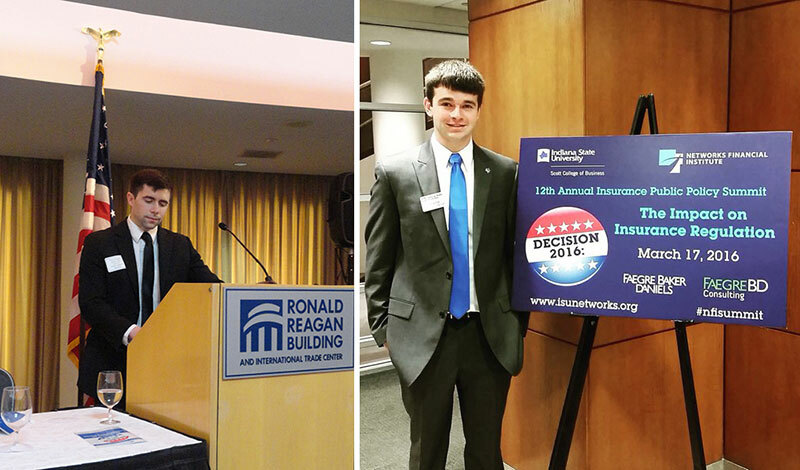 Congratulations to Finance Program juniors Tyler Pfaff and Kaitlin Goings for their scholarship awards. 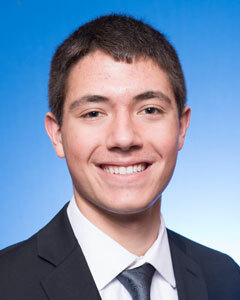 Tyler, a Financial Planning Major and Financial Services Minor, was awarded the 2016 Northwestern Mutual Financial Planning Scholarship. Kaitlin, a Financial Planning Major, was awarded both the Dr. Eurico Ferreira Finance Scholarship and Forrest Sherer Scholarship​. Indiana State University has maintained its registration with Certified Financial Planner Board of Standards Inc. (CFP Board) to provide a financial planning program with Bachelor of Science in Finance. 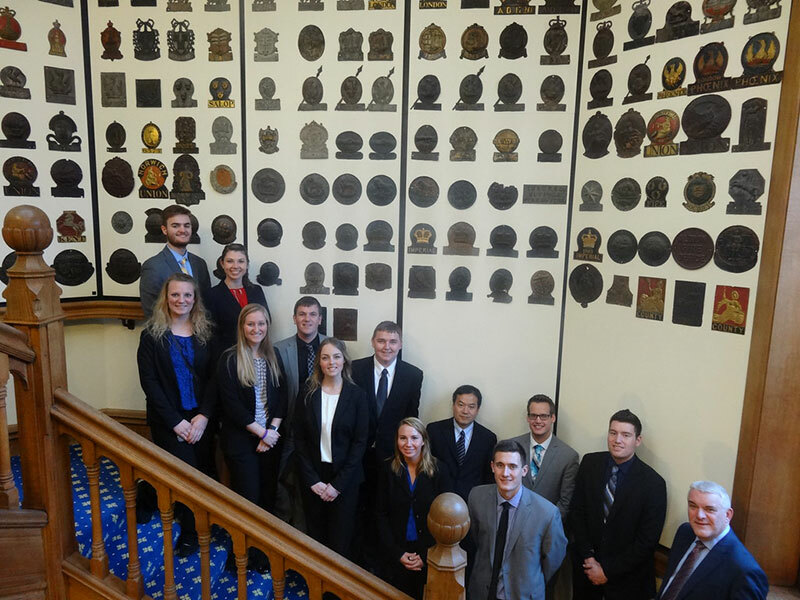 Students completing the financial planning program at Indiana State University will have met the education standard of the education, examination, experience, ethics and other requirements needed for CFP® certification. 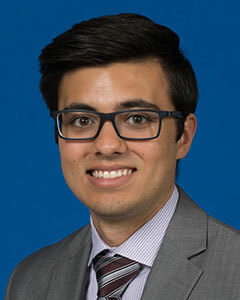 “As student interest in financial planning as a career continues to grow, we anticipate that Indiana State’s program will contribute significantly to the number of qualified candidates seeking to attain the certification, the standard of excellence for competent and ethical financial planning,” said Richard P. Rojeck, CFP®, chair of CFP Board’s Board of Directors. Today, CFP Board partners with over 360 programs at more than 225 institutions that meet specific criteria for educating individuals who wish to fulfill the education component for obtaining CFP® certification. More than 70,000 individuals have currently successfully completed the initial and ongoing certification requirements. Scott College of Business '97 Insurance and Risk Management alumnus and Gibson Insurance CEO Tim Leman spoke on the importance of graduates not setting limits on themselves. "If you set limits, you will only get there. To be unconditional, you have to have no limits," Leman said, using his rise through the business world as a model. "Being unconditional is not just about not setting limits, though. 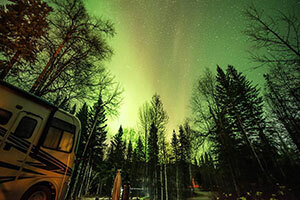 It's about setting higher and better ones." 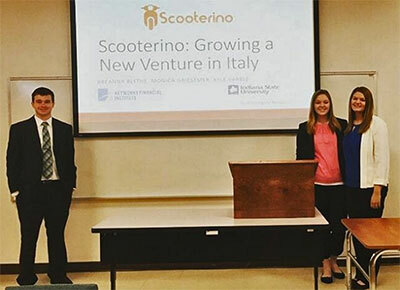 Indiana State’s proximity to the Indianapolis Motor Speedway helps attract students from one of Brazil’s leading MBA programs to the Scott College of Business for an annual seminar on finance. Now in its third year, the week-long program for students at Fundação Getulio Vargas, a university and think tank, is timed to include the Indianapolis 500. It also features three days of classes and visits to the Federal Reserve Bank and Money Museum in Chicago. Aruna Chandrasekaran, professor of management in the Scott College who coordinates the seminar, calls Fundação Getulio Vargas “the Harvard of Brazil” and notes that Indiana State is one of only three American universities with which it partners on such programs. The Brazilian students will be here from May 22 to May 30, 2016. The Indianapolis 500, the most prestigious event of the IndyCar calendar, has its 100th running on May 29. 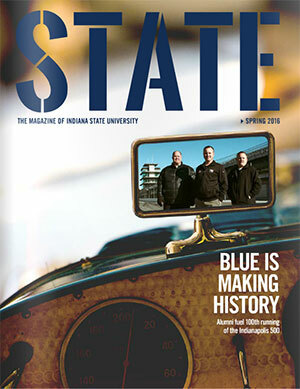 State Magazine celebrates the occasion with articles about the event and Indiana State's connections; from alumni at Indianapolis Motor Speedway to Team Sycamore Racing, now in its 9th year. The university has strong ties with the industry with the minor in Motorsports Management being introduced a decade ago. Once he became a Sycamore, Leman knew he had made the right choice. 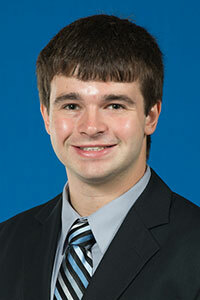 He enjoyed being active in campus organizations and getting to know fellow students and faculty. "I liked that I knew everyone. ISU is small enough that you can have a personal relationship with your professor, with the dean of your college and with many, many students," he said. "I got to know lots of the other fraternity guys and sorority girls." Some of his campus activities included Lambda Chi Alpha (social fraternity treasurer), Gamma Iota Sigma (business fraternity president), Alpha Omicron Pi (social sorority "Sweetheart Guy"), intramurals, math lab tutor and much more. "I got to be involved and active on campus," he said. "I feel like I got the full college experience." Outstanding students, staff and faculty were recognized at the annual Honors Day awards. 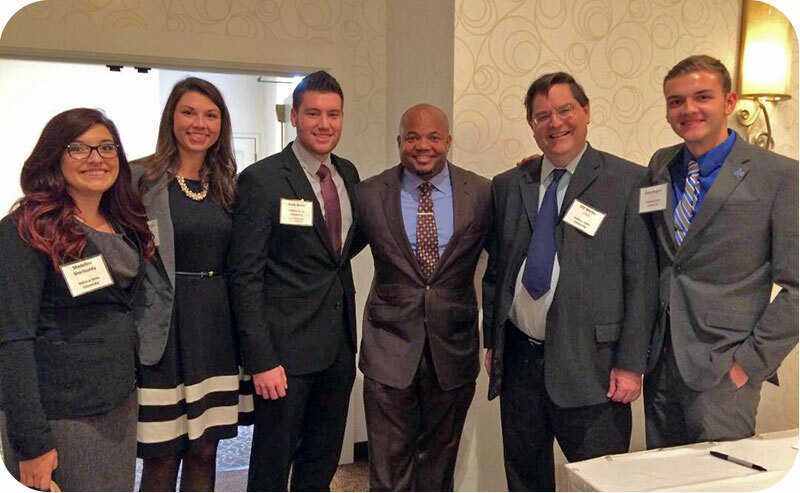 Yesterday's event was organized by FPA of Greater Indiana. 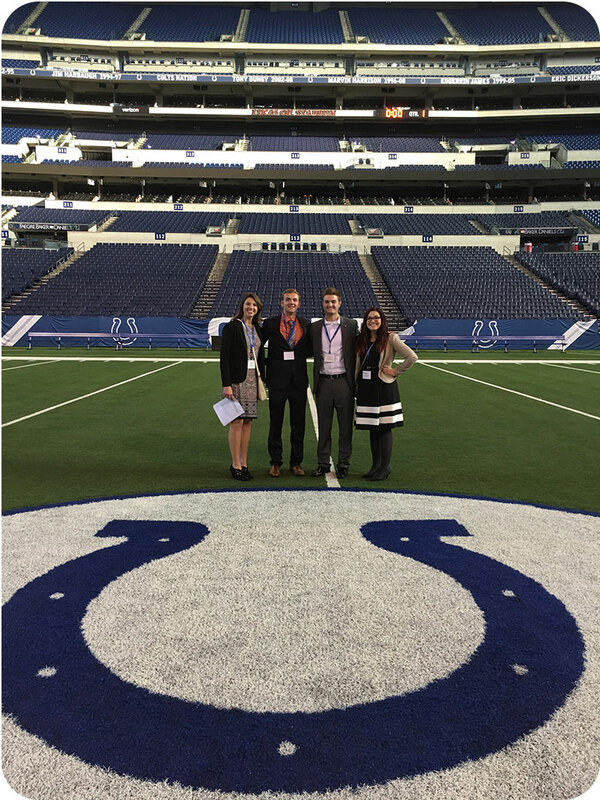 Our students were sponsored by Focus Indiana with the help of the ISU Career Center and the students had a wonderful experience. 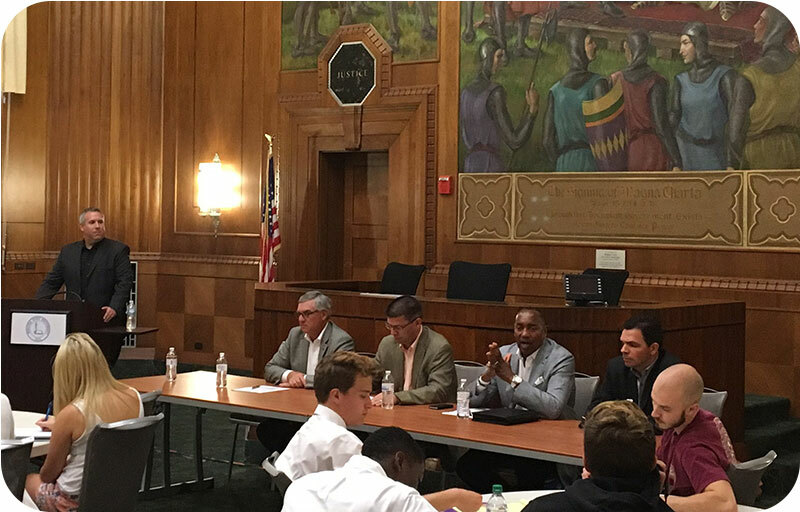 The students “shadowed” a financial planner in the morning, and attended a networking luncheon with Secretary of State Securities Commissioner, Alex Glass and Investor Education Coordinator, Kelly Griese. 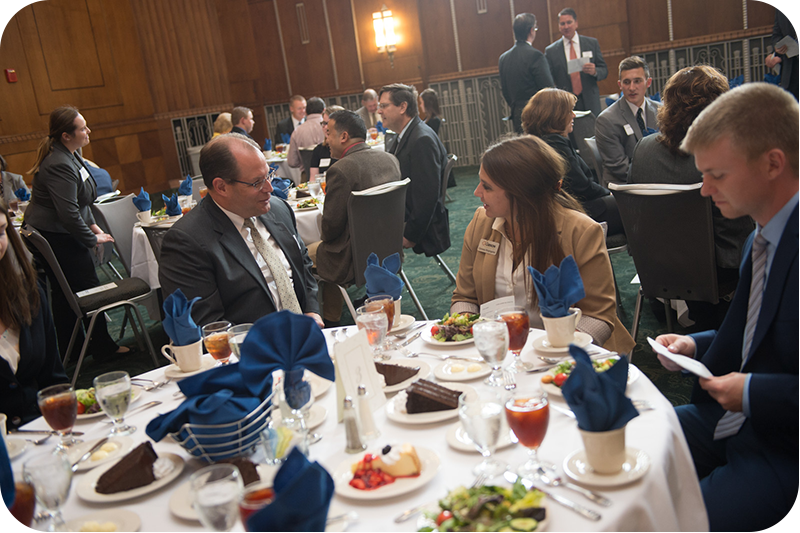 The Meis Student Development Center held the 16th semi- annual Executive Dining Experience on April 6th in Indianapolis. 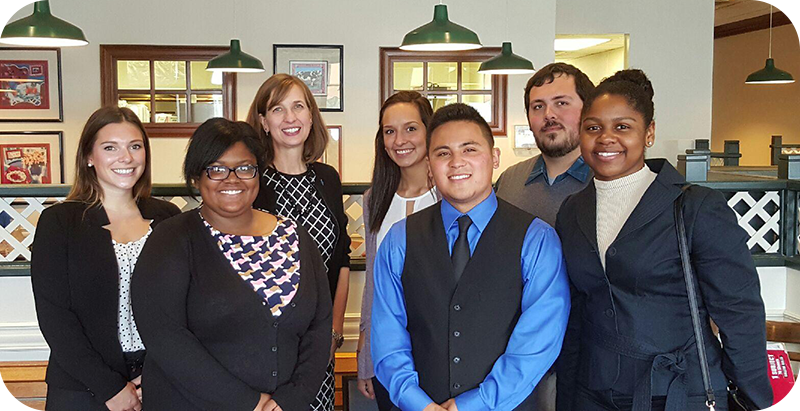 Students had a chance to network and dine with professionals at the Skyline Club. Here are a few shots from the evening. This is one of our favorite events each semester! 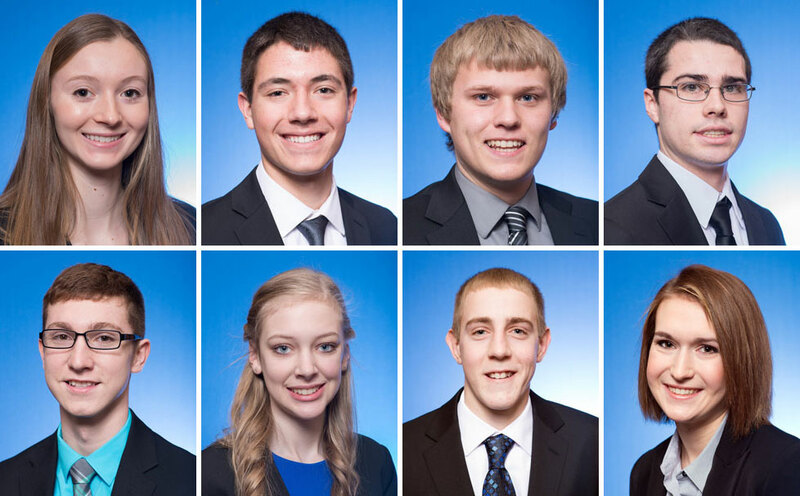 These students were nominated by faculty and staff to represent not only the Scott College of Business but also Indiana State University. 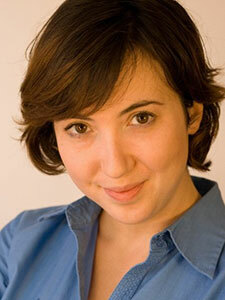 Guest speaker Melissa Bowler showed how you can improve your sales performance by using improv! Melissa is a founding member and the Executive Director of the Providence Improv Guild, and will share how useful improv can be in training salespeople as well as improving sales performance. Jim Elliott would likely agree that we are all pawns of the market. We go where the jobs are, and we sell what people want to buy. Were it not for both of these conditions, Elliott — a Lowell, Ind., native who graduated from Indiana State in the winter of 1981 — would have ended up starting his career with a marketing firm in Chicago or perhaps Indianapolis. Instead, his destiny lay in Texas, where he would log time not only in marketing, but also retail management and high school teaching. 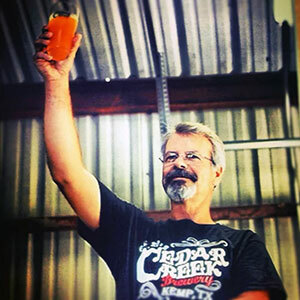 All of that, however, was arguably a prologue for Elliott’s signature professional contribution as the entrepreneurial owner and operator of Cedar Creek Brewery nestled in the small town of Seven Points. As a high schooler, Kent Kramer worked part time in a grocery store in his Muncie hometown. That’s when he discovered the profession he would like to pursue. In his senior high school year, Kramer was offered an Indiana State academic scholarship and visited the campus. “I fell in love with it,” he said. 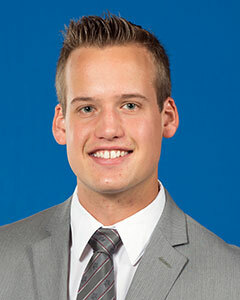 Once a Sycamore, Kramer became involved in campus activities, which added immensely to his college experience and future career. 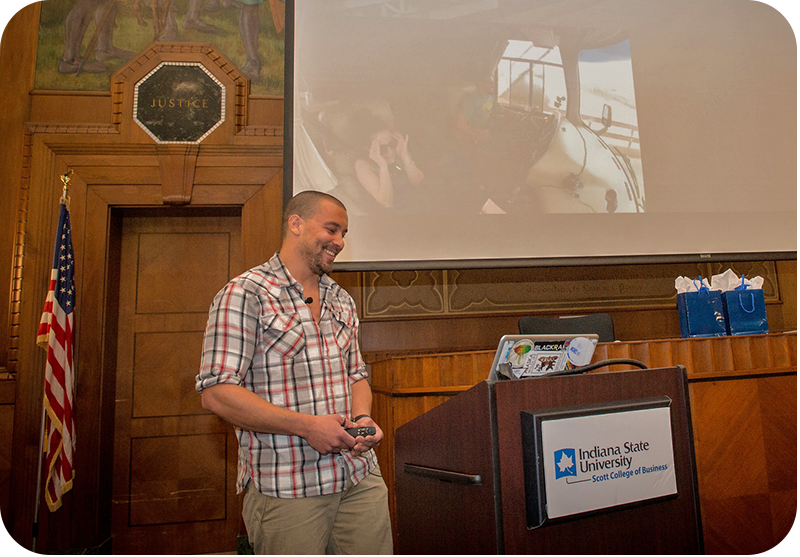 On February 9, "Chris Penn presented in our beautiful former courtroom about his lifestyle revolving around his YouTube Channel, “Chris and G Travels.” In his presentation, Chris talked about how the ISU Study Abroad Program motivated him to travel during his life. 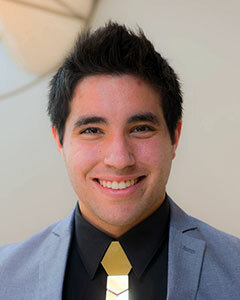 He graduated from ISU in 2008 and began his adventure evolving into where he currently is able to earn a living via his YouTube Channel network and the resulting connections to businesses YouTube has facilitated. He and his girlfriend, Gina, are truly Digital Marketing Entrepreneurs. The students in my Promotional Strategies unanimously voted that his presentation was “worth their time” while also being “inspiring” for them to integrate digital marketing tools into their professional lives." 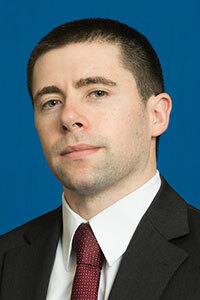 said Dr. Vernon Sweetin, Assistant Professor of Marketing and Operations. Thanks go to to our Digital Marketing team of Dr. Bhowmick, and Dr. Mikeska, with special praise to Ishaan Vadhera, Director of the ISU Student Marketing Company. 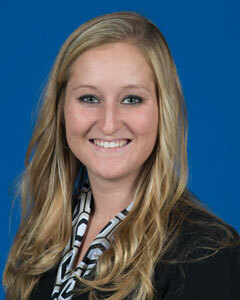 Kaitlin from the Meis Center was very helpful with the launch of our promotional activities and many other aspects. Betsy Simon, Assistant Director of Media Relations wrote some very favorable articles helping to increase our attendance. Dr. Schikora generously facilitated financial support. Thanks again to all the faculty who assisted in numerous ways. Carolyn Snow is Director of Risk Management at Humana Inc. and is also the current Risk Manager in Residence at the Scott College of Business. Her presentation was interesting and covered the upcoming mergers between Humana and Aetna, between Anthem and Cigna and the recent one between UnitedHealth and Catamaran. She also talked about the risk management and what it means for sharing economy companies such as Uber, Lyft, Airbnb and Alibaba. Another hot topic in the insurance world at the moment is cybersecurity and she briefly touched on the methods used by Humana to protect their data. 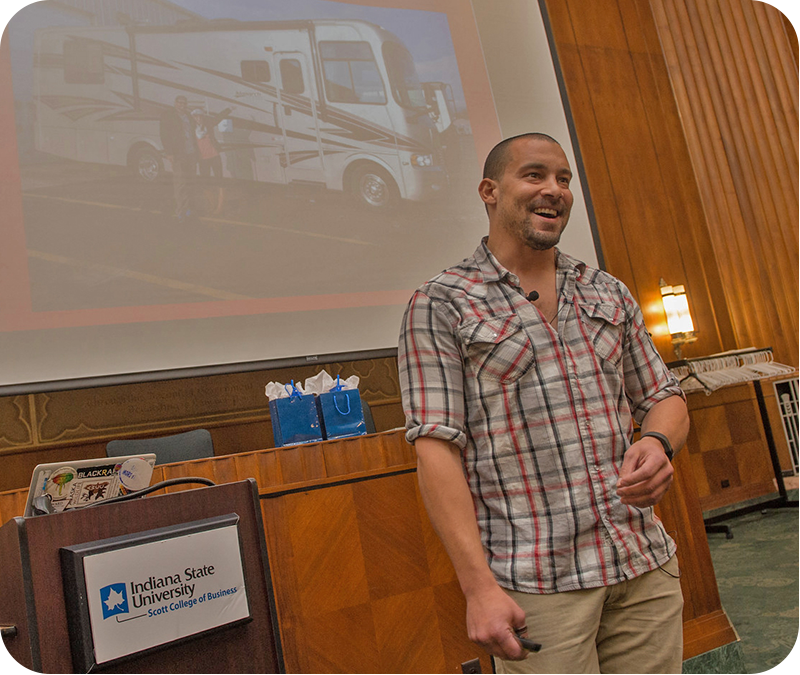 "During his college internship, 2008 Indiana State University graduate Chris Penn, learned the 9-5 life was not for him and he began searching for an alternative lifestyle, which he did by traveling shortly after he graduated from Indiana State," Vernon Sweetin, assistant professor of marketing. Penn, who travels with his girlfriend Gina, eventually began making extra money through social media and posting travel videos to YouTube, where the couple has attracted more than 47,000 subscribers to their channel, Chris and G Travels. The couple will share their story and discuss the benefits of the effective use of social media in today's digital world during a presentation at 12:30 p.m. Feb. 9 in the Federal Hall courtroom, Room 223. The presentation is open to the university community. 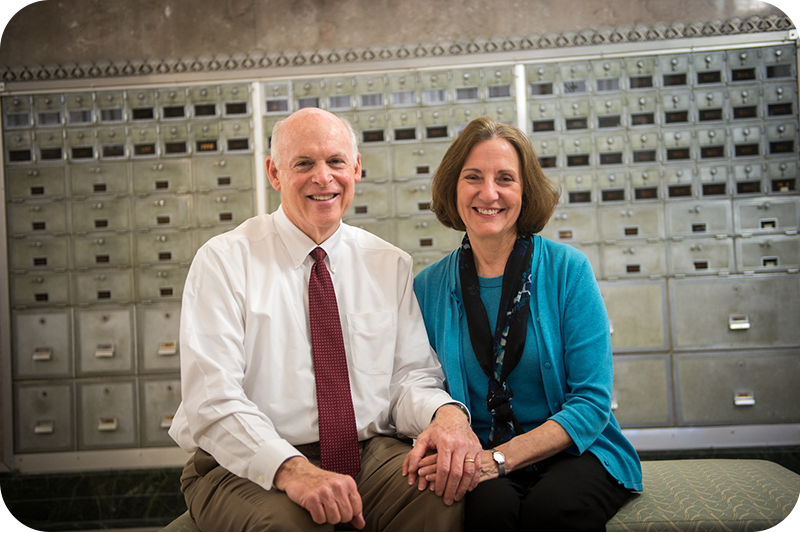 Working together as undergraduate students on the Purdue University yearbook, Connie and Bruce McLaren developed a rapport that continues today. After more than 40 years, they are still partners — in work and in life. In 1979, the two returned to Indiana to join the faculty of Indiana State University. 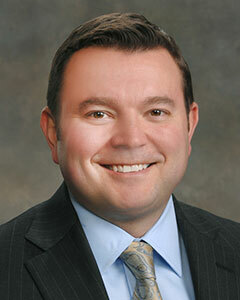 Bruce is associate dean and professor in the Scott College of Business. 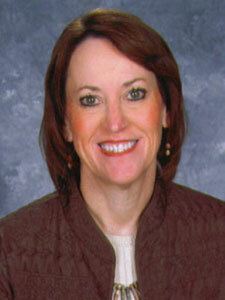 Connie is professor of operations and supply chain management in the marketing and operations department of the college. 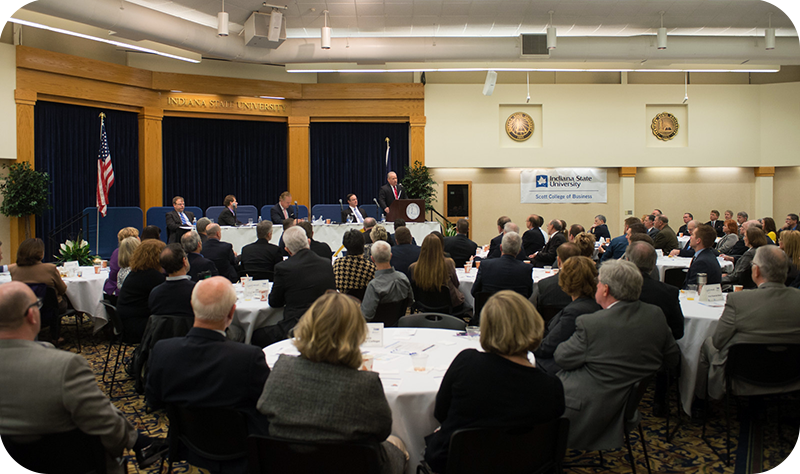 Economic predictions for the year ahead were made during the annual Groundhog Day Economic Forecast event, sponsored by Indiana State University's Scott College of Business, Terre Haute Chamber of Commerce and Terre Hate Savings Bank & Financial Service. Indiana's gross domestic product of $290 billion and substantial growth in personal income level has put the state on an OK path in the new year, Bob Guell, professor of economics, said. In contrast, he described economic conditions in Terre Haute as "tolerable," as the unemployment rate comes in at 5.6 percent and personal income levels continue to be "stuck in the mud." 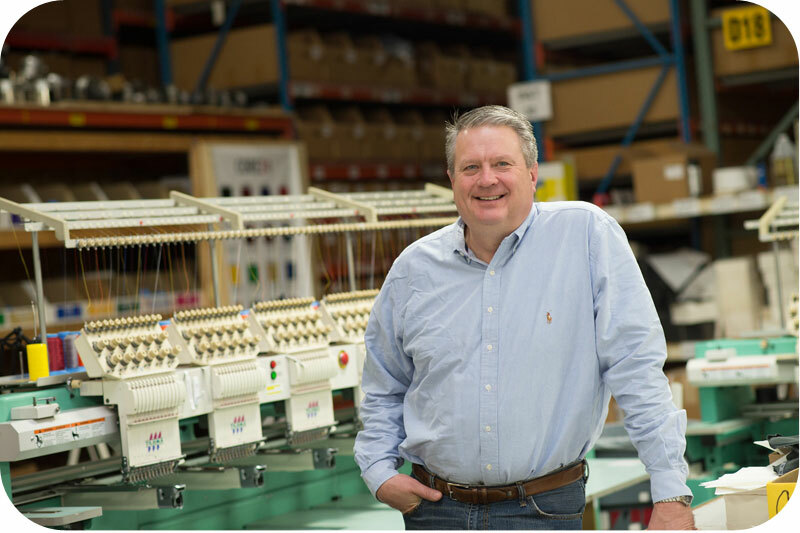 Steve Witt, president of the Terre Haute Economic Development Corp., sees a more hopeful year for the Wabash Valley, which attracted attention in the last year from international companies in Italy and Belgium and domestic businesses in New Jersey, California and North Carolina. 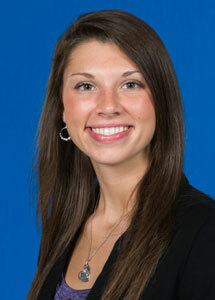 While at Indiana State, Swayne also was a resident assistant and later a graduate assistant hall director. 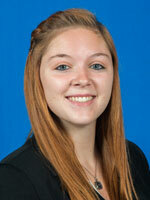 “That afforded me the opportunity to get involved in higher education administration,” she said. 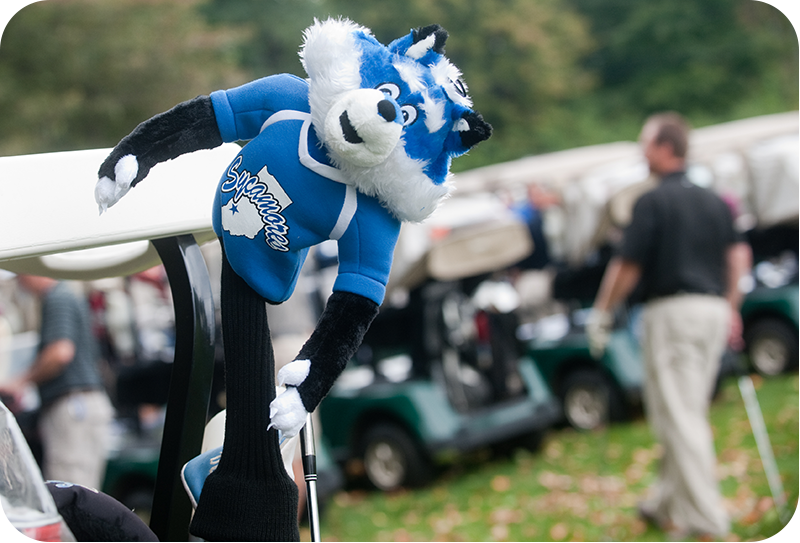 Both husband and wife are two-time degree alumni of Indiana State. 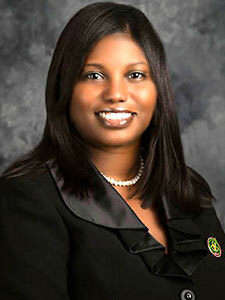 Mari Swayne earned her Bachelor of Science degree in business education and her Master of Science degree in student affairs and higher education. Romel Swayne graduated with a Bachelor of Science degree in business administration and a Master of Science degree in human resources. The couple lives in Indianapolis. Business education is about more than teaching for Dena Irwin, ’94. The Indiana State University graduate and teacher is ready to take her passion for the subject to the state level after being named the state program leader for business, information technology, entrepreneurship and marketing education. If you are in Florida this week, we hope you will attend one or both of the ISU Alumni Receptions which Dean Smith and John Heintz, Senior Vice President of Development at Indiana State University Foundation, will be at, along with President Daniel J. Bradley and First Lady Cheri Bradley. Marina Jack's | 4:00 p.m. - 6:00 p.m.
Naples Beach Hotel and Golf Club | 6:00 p.m. - 8:00 p.m.